Summertime brings an abundance of fresh organic peaches, which always results in lots of smiles in our house as we try to find new ways to enjoy them at virtually every meal. 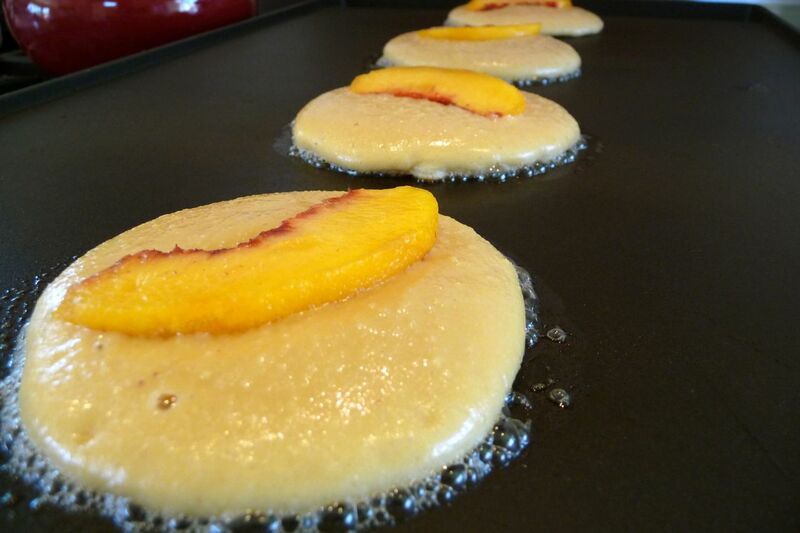 Of course, a super easy way to savor summer peaches, is to simply add them to your favorite pancakes! 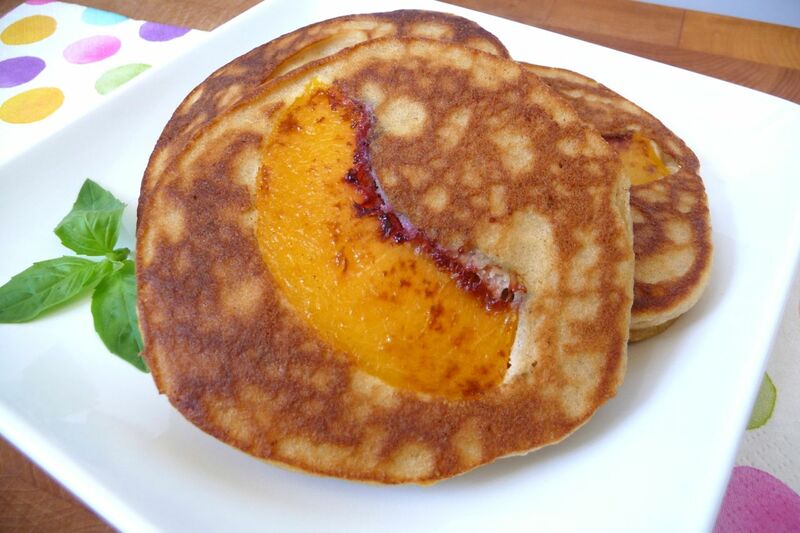 Peach pancakes make the perfect weekend family breakfast, or even a quick, yet healthy weeknight dinner. Personally, I frequently opt for my fluffy almond flour pancakes, because their mild flavor and light, fluffy texture is more reminiscent of traditional white flour pancakes. Yet, unlike refined white flour, almond flour (and coconut flour) provides a good dose of protein, fiber and nutrients in every bite! STEP TWO: Fire-Up The Griddle! Once you’ve prepared your pancake batter, preheat your griddle. While waiting for the griddle to get hot, peel and slice three fresh ripe peaches. A quick and easy way to peel peaches … bring a stockpot of water to a rolling boil. Add whole peaches and allow to steep for one minute. Using tongs, remove peaches from boiling water and place in a cold water bath. Once cooled to touch, peel off skins and slice. 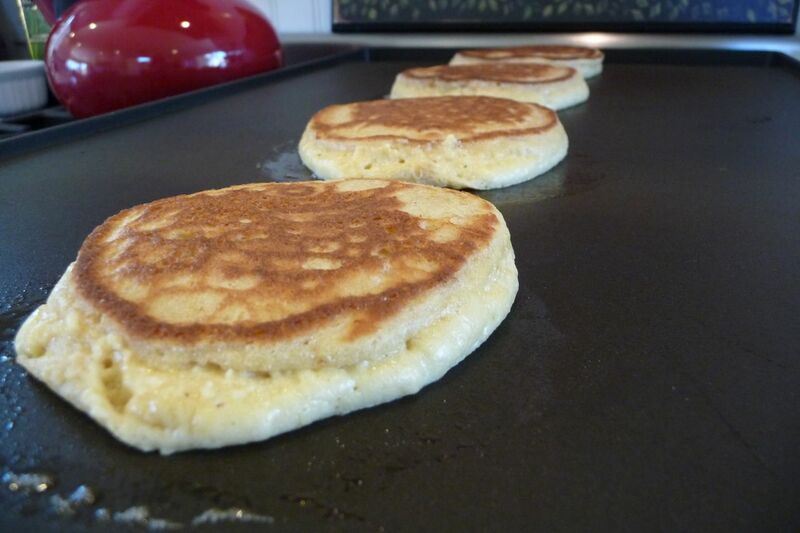 When making grain-free pancakes, it’s best to keep them small since they’re so delicate. Keeping the pancakes small (about 3″ in diameter) makes it easier to flip them and also helps them cook-up nice and fluffy! Another trick is to use a slightly damp nylon spatula, which helps to keep the pancake from sticking to the spatula. Serve these scrumptious peach pancakes hot off the griddle with cultured butter and pure maple syrup, or a drizzle of raw honey. Yum! Those are so cute! Another great use for peaches. 🙂 Love your ideas! Your almond flour pancake recipe is amazing!! YUM! Thank you so much! I must admit that I was close to NOT trying these because other almond or coconut flour pancake recipes have been a flop for me in the past (the kids won’t eat them and I end up eating them all so the ingredients aren’t “wasted”…sigh). Butter and maple syrup on top really took these ‘up a notch’ and I loved them. I love this idea! The picture’s are making me hungry! Wowwwww! That sounds really amazing. Peaches I love like anything. This pancake I am surely going to have. 1. I made the Power Pancakes, but used whole wheat flour b/c I didn’t have the other flours. I wasn’t able to soak the grains b/c I didn’t plan ahead 🙁 I will definitely take the extra soaking step the next time. 3. I used EnerG Egg Replacer for the eggs. 4. I used ground chia seeds for the flax seed b/c that’s what I had on hand. 5. I used non-dairy margarine (Spectrum dairy & soy free). We loved the addition of peaches and the maple syrup in the recipe to replace the sugar. 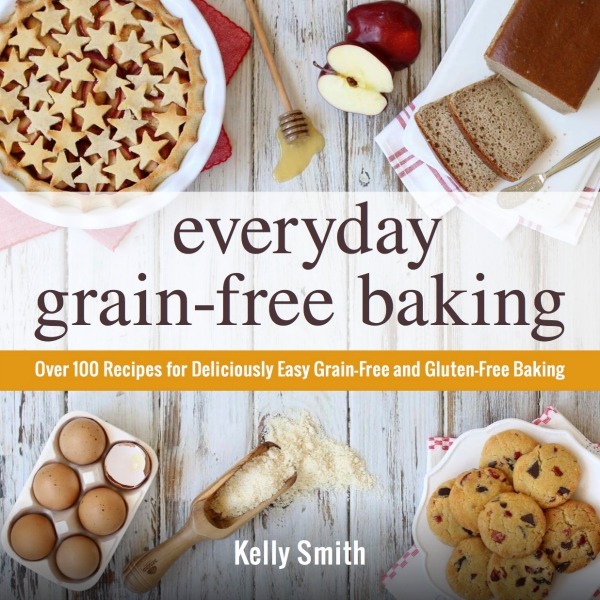 Thanks for another amazing recipe, Kelly!